Pharoahs Fortune slot machine from IGT is a classic bricks and mortar title that uses the well worn classic Egyptian theme on its online and mobile versions as well. It has 5-reels, 15 paylines and a maximum jackpot of 10,000 coins per line bet. The game has a bonus round, which gives you up to 25 free spins with a multiplier of between 2 and 6x. You can check out the full Pharaohs Fortune slot review below, and there is a bonus from Leo Vegas for you as well. 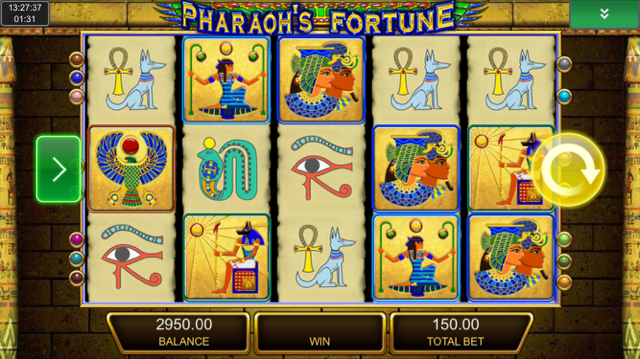 If you’re a fan of traditional live slot machines, you will no doubt have already encountered IGT slots’ Pharaohs Fortune slot game in many of your favourite bricks and mortar casinos – and the good news is that you can now also enjoy the game on your desktop or preferred portable device. A simple five-reel, 15 payline game, Pharaohs Fortune hangs it hat on its quirky visuals and sound, with the inside of a pyramid providing an atmospheric setting and “Walk Like An Egyptian” by the Bangles proving a fitting soundtrack. Unique symbols to feature in the game include Egyptian gods, a selection of hieroglyphs and the omnipresent scarab beetle, with the game’s logo acting as the wild. Playable from as little as £0.15 per spin, the Pharaohs Fortune slot machine boasts a sizeable base game jackpot of 10,000x players’ line bet and a free spins feature in which up to 25 bonus games and a 6x multiplier are up for grabs. As such, it is a medium variance game that offers a nice balance of decent-sized wins that arrive with a moderate frequency and smaller payouts that keep players’ bankrolls ticking over. Perhaps unsurprisingly given its bricks and mortar background and old-school charm, the Pharaohs Fortune slot game is relatively basic when it comes to bonus features. That being said, the one free spins game that is available to players is a very good one and can have a dramatic effect on their overall winnings. Triggered whenever Pharaohs Fortune symbols appear anywhere on reels one, two and three, players will initially be awarded three free spins, but will then be transported to a new screen displaying 30 stone blocks. Under 22 of them they’ll find an extra free spin, while five more of them will reveal an additional prize multiplier. The remaining three, meanwhile, will collect their total and start the spins. As an additional incentive, all free spins that players accumulate are guaranteed to award a prize of at least 3x their triggering bet, while finding three subsequent scatter symbols can prolong the feature up to a maximum of 999 games – needless to say, however, that particular outcome is highly unlikely! Despite being a very traditional slot title, the Pharaohs Fortune slot has enough quirky charms to attract new players’ attention and its awesome free spins feature will certainly keep them entertained for awhile. Like the Pharaohs Fortune slot review? Check out these as well…..